GE Aviation's CT7-2F1 has been type certified by the Federal Aviation Administration, marking another milestone in the path toward certification of the aircraft it powers — the Bell 525 Relentless. Nearly 500 passengers on the Viking Sky cruise ship were evacuated by helicopter in a dramatic rescue operation in Norway this weekend. Five people have been killed in the crash of a Bell 505 helicopter in Kenya — the first fatal crash for the model that was certified in December 2016.
International Defense and Aerospace Group (IDAG) is acquiring U.S. Aviation Training Solutions, the flight school formerly known as Bristow Academy. At least six securities litigation firms are looking into whether Bristow Group and its officers and directors violated federal securities laws. Bristow Group and Columbia Helicopters have mutually agreed to terminate Bristow's agreement to acquire Columbia, the companies announced on Feb. 11. The Ontario NDP has released a second set of leaked government documents that reportedly indicate the Ford government is planning to privatize the Ornge air ambulance service. The Sikorsky-Boeing SB>1 Defiant program team has released video of the aircraft's initial ground run. The program is now advancing through the ground testing activity in the build up to first flight. An Erickson Aircrane has crashed into a dam during firefighting operations in the Australian state of Victoria, according to VicEmergency, the state's official emergency information outlet. The Bell V-280 Valor achieved its namesake optimal cruise speed of 280 knots on Jan. 23, 2019, at Bell's Flight Research Center in Arlington, Texas. ADAC Luftrettung has started a feasibility study for a pilot project to adapt Volocopter's electric VTOL aircraft as air shuttles for emergency doctors. Subaru Corporation has announced the first flight of its prototype UH-X, the new utility helicopter the company is building for Japan’s Ministry of Defense. Sikorsky and Boeing have released the first photos of the SB>1 Defiant helicopter developed for the U.S. Army’s Joint Multi-Role technology demonstrator program. 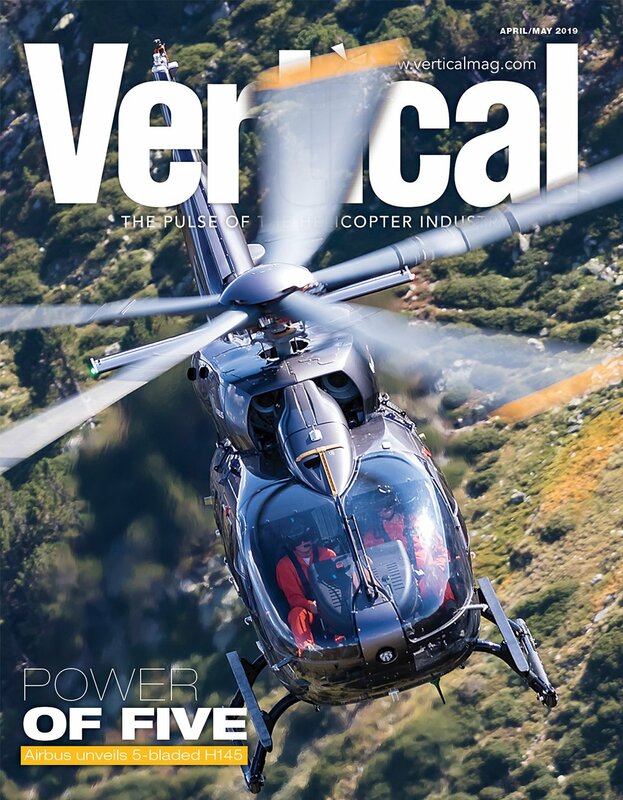 As 2018 draws to a close, we review the year in helicopter industry news with our annual countdown of the most-viewed articles on verticalmag.com. Mast bumping and a loose item of clothing that became caught in the tail rotor appear to have been factors in separate helicopter accidents that killed two brothers in New Zealand earlier this year. EASA has ordered more safety checks for AW169s and AW189s, as investigators have identified a mechanical issue with the tail rotor control system as causing the Leicester AW169's loss of control. 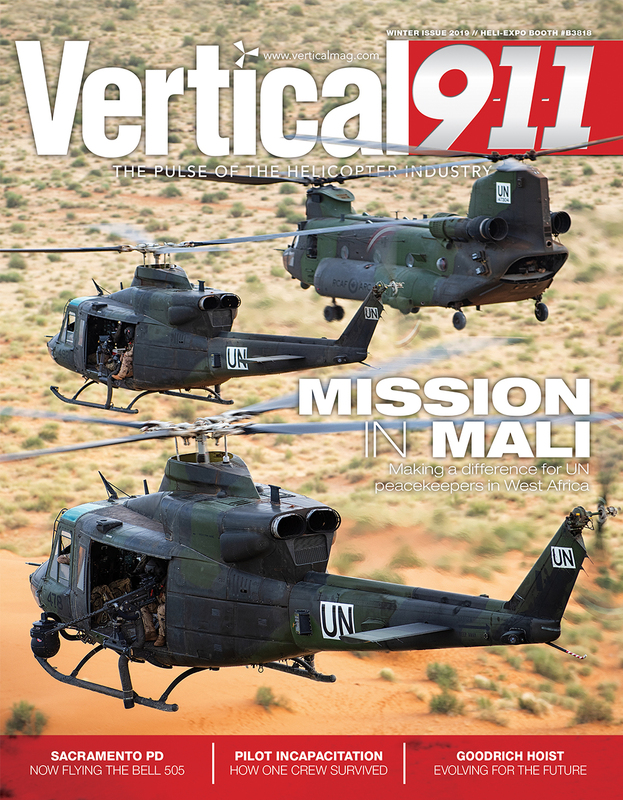 Now in its 10th year, the Vertical Photo Contest celebrates the very best in rotary-wing photography. 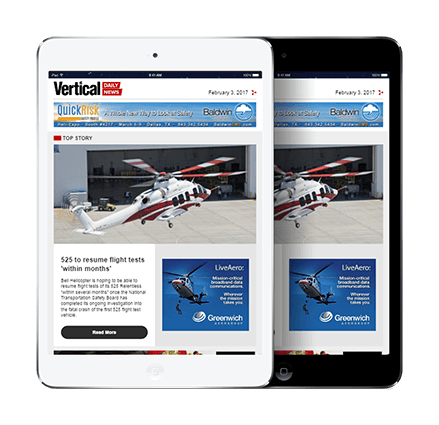 The Daniel Guggenheim School of Aerospace Engineering at Georgia Institute of Technology has been recognized by The Vertical Flight Society as a Vertical Flight Heritage Site. Operators of Leonardo AW169 and AW189 helicopters have been instructed by the European Aviation Safety Agency to conduct additional inspections of their tail rotor flight control systems. A Leonardo AW169 helicopter belonging to the owner of Leicester City Football Club has crashed outside the King Power Stadium in Leicester, England, on Oct. 27. The U.S. State Department has made a determination approving a possible Foreign Military Sale to the United Kingdom of 16 Extended Range H-47 Chinooks, worth an estimated $3.5 billion. 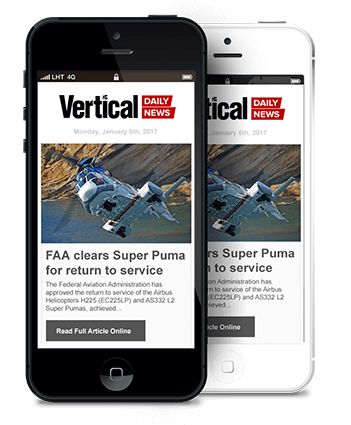 A growing community of aerospace innovators, engineers, futurists and investors believe that the next urban transportation revolution will be in the air. Helicopter Association International has extended the deadline for nominations for the 2019 Salute to Excellence Awards to Oct. 19. The crew of a Bell 407GXP operated by Simrik Air has performed a life-saving medevac of a 25-year-old woman following the crash of an Airbus H125 near Kathmandu, Nepal.